Geraldine Jordan, accustomed to living with her disability, learns the meaning of rejection early. To acquire a desirable suitor like Alistair McKenna -- the man of her lifelong dreams -- is clearly slim to none. When a treasured aunt arranges marriage to esteemed Chicago banker in search of a wife and mother for his young ward, Geraldine finds hope. What does it matter it's a business proposition? A wedding is a wedding -- even if it doesn't include Alistair. At her aunt's sudden passing, Geraldine finds herself under the care of her disgruntled Uncle Henry, who not only disapproves the business proposition; he's convinced she's unsuitable for any man. Blocking the betrothal, he hires Geraldine out as a servant to a patronizing family in desperate need of a governess. Can Geraldine defy her uncle when she discovers her prospective groom is none other than her life-long love, Alistair McKenna? 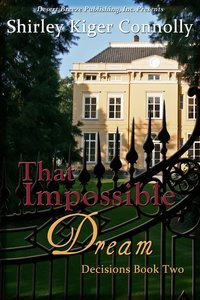 About "That Impossible Dream (#02 in Decisions Series)"
Customer Reviews For "That Impossible Dream (#02 in Decisions Series)"
Reading this book was like trying to run the 100 yard dash in chest-deep water. The story boils down to about 2 days in the life of Geraldine with lots of references to times and deeds the reader knows nothing about. Then in the epilogue, her sister and others have complete changes of character... in the space of 6 weeks? Wow.